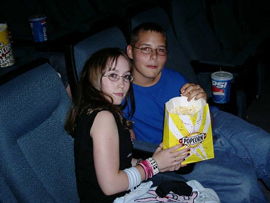 Two young people on a date at the movies. A first date is an exciting occasion for many American teenagers. Some teenagers experience anxiety before their first date and many see it as their entrance into young adulthood. Today, first dates often take place with a group of friends. Couples may decide to go to the movies or to dinner as a large group, rather than alone. Others may prefer to hang out at the mall. Many first dates take place the night of major school events such as prom or a homecoming dance. Some parents may drive the couple to and from the date. Oftentimes, the young man will pick the young lady up from her house. Parents usually decide when their teenager is mature enough to go on a date. Sixteen is the most common age for a first date. However, some parents may decide that another age is more appropriate. Traditionally, parents also set curfews for their teenagers, which are usually based on age and maturity. Typically, the curfew gets later as the teenager gets older.